We’d love your help. Let us know what’s wrong with this preview of Why Not Women? by Loren Cunningham. To ask other readers questions about Why Not Women?, please sign up. Be the first to ask a question about Why Not Women? An excellent book that covers all of the relevant issues, one of the best I've read thus far. The bulk of the book is spent on the contested passages (1 Cor. 11, 14, and 1 Tim. 2) in a number of chapters, in careful and extensive detail. The book is heavily documented too. Growing up in circles that denied women the right to hold public office in the Church, I was told that all such arguments were nonsensical, and either denied the Scriptures or got around the problem by claiming Paul didn't real An excellent book that covers all of the relevant issues, one of the best I've read thus far. The bulk of the book is spent on the contested passages (1 Cor. 11, 14, and 1 Tim. 2) in a number of chapters, in careful and extensive detail. The book is heavily documented too. Growing up in circles that denied women the right to hold public office in the Church, I was told that all such arguments were nonsensical, and either denied the Scriptures or got around the problem by claiming Paul didn't really write them. To my surprise, it turns out that the argument is not based on the supposed importation of "radical feminism" into the Church, but is rather grounded in a careful examination of the texts themselves and in their structures (did anybody else know there was a chiasm in 1 Cor. 14?). It also revealed to me how important correct translation is, as a number of passages have not been translated as clearly as they could have been. In this regard, the ESV is a particularly unreliable guide to the actual statements of Scripture. As J. I. Packer said 25 years ago, the burden of proof now lies with those who would deny women full equality of office in the family and the Church, and not with those who seek to include them. This is, hands down, the very best book on women in Christian leadership I have ever read. There is no glossing over of difficult passages and no dependence on a handful of convenient scriptures commonly used to limit the role of women in the body of Christ. I cannot recommend this book highly enough for anyone, male or female, who has ever wrestled with the subject of women in ministry. This is an awesome, life-giving, healing resource. Read it! A very powerful book. I'm not 100% sure I agree with everything but it challenged me immensely and gave me a lot to think about. I love how footnoted it was. Entirely readable but still academic. Why Not Women? explores the role of women in "missions, ministry, and leadership." It emphasizes the very things that grounded my faith as young teenager: Jesus' radical, culture-changing attitude towards women. The knowledge that this God looked upon women and treated them equally changed the way I app A very powerful book. I'm not 100% sure I agree with everything but it challenged me immensely and gave me a lot to think about. I love how footnoted it was. Entirely readable but still academic. The knowledge that this God looked upon women and treated them equally changed the way I approached life. I was raised in the church and God's fair, loving, and just treatment of women should not have taken me by surprise. But it did. I was reading Twelve Extraordinary Women: How God Shaped Women of the Bible, and What He Wants to Do with You one day when it finally dawned on me how radical and kind Jesus was. It led me to worship. It still blows my mind and steals my heart. In fact, the moment when I first understood the implications of Jesus' conversation with the women at the well, I realized a passionate, awe-filled love for God that has never left me. I cannot overemphasize the sense of value it gave me to know that this Jesus went against all the cultural expectations of his time to bring grace to that woman. If this book did nothing but remind me of that sense of value, it would have been worth it. The Greeks did not value women. The Romans did not value women. The Jews ignored the very precepts that gave equality to women. Then Jesus came...and kabam. He changed everything. Cunningham and Hamilton argue that the church, however, belittle women when ignoring their role in church leadership, both in the early church and now. A very hard, powerful book. Definitely worth reading! I feel like many of the things I have been taught have been challenged, and not in a bad way. This is only the beginning of a larger debate I look forward to exploring. Women pastors (or women in church leadership in general) remain a controversial subject and there are one or two things I'm not sure I totally understood. 1 Timothy 2:11-15 still puzzles me. I think the authors provide a very good option, but they don't explain thoroughly enough how they got to their explanation. Very interesting. I'm not sure that I agree with all of their conclusions, and some of their defenses seemed a little weak, but on the whole they made a very compelling case and I really appreciate their thoroughness in discussing practically every relevant scripture. My overall impression is positive: it was informative and encouraging in many points and at least left me with something to think about in those points with which I'm unsure of my agreement. Why Not Women gives a clear, intelligible, and meaningful look at how we need to learn to interpret scripture in general and specifically how we should examine the role of women in ministry. Cunningham and Hamilton take a careful look at the context, culture and language of specific difficult passages and offer their trained guidance on how to make sense of them. I felt empowered and encouraged, I learned a lot and am thankful for the clarity and insight provided. This book opened my eyes to the difference between the beliefs we hold from our upbringing and culture, and the beliefs actually based on the Word of God. It's exhaustively researched and infinitely practical. In "Why Not Women", Loren Cunningham explains the history behind the oppression of women in Greek and Roman societies which led to centuries of discrimination in our western society, and even infiltrated the Church. He shows how Jesus and the early church were truly revolutionary in their This book opened my eyes to the difference between the beliefs we hold from our upbringing and culture, and the beliefs actually based on the Word of God. It's exhaustively researched and infinitely practical. In "Why Not Women", Loren Cunningham explains the history behind the oppression of women in Greek and Roman societies which led to centuries of discrimination in our western society, and even infiltrated the Church. He shows how Jesus and the early church were truly revolutionary in their equal treatment of women. David Hamilton digs into the controversial passages in God's Word to show how our preconceived biases have tainted our interpretation of these verses. He clearly breaks down the original language of the text in order to show what the writers were truly saying. If you are willing to let God's Word, not your opinions, determine what is truth, this book will open your eyes to God's heart for women, and the giftings and callings he has given them. I might write up a longer review later, but in short: I liked this book, I found it generally persuasive, although the arguments seemed to push certain ideas beyond where they should have gone. The first four chapters, written by Cunningham, are a little too polemical for my tastes and add little overall to the book. There is also more promotion of his missionary organisation than feels necessary. The remainder of the book, written by Hamilton, feels more scholarly in tone and less emotional. I ag I might write up a longer review later, but in short: I liked this book, I found it generally persuasive, although the arguments seemed to push certain ideas beyond where they should have gone. The remainder of the book, written by Hamilton, feels more scholarly in tone and less emotional. I agree that Christ and Paul's attitudes towards women were radical given their context. However, I'm not sure that's necessarily the same as the idea of equality advocated here. Perhaps it is, but in general you can tell this book was written by missionaries and not by academics. Now this was a fascinating book. The authors are conservative Christians, and yet they do manage to climb out of the unbiblical idea that women weren't and shouldn't be leaders of any kind within the Christian community. And they do it well, outside of one tiny, ridiculous swipe at Gay people in the intro (the only one there, and easily ignored for what it is). The authors use the Bible itself, going back into its original languages and linguistics to cover topics like should women keep silent i Now this was a fascinating book. The authors are conservative Christians, and yet they do manage to climb out of the unbiblical idea that women weren't and shouldn't be leaders of any kind within the Christian community. And they do it well, outside of one tiny, ridiculous swipe at Gay people in the intro (the only one there, and easily ignored for what it is). The authors use the Bible itself, going back into its original languages and linguistics to cover topics like should women keep silent in church, and are women allowed to lead and/or teach? I'd recommend this to everyone. I think women can be called by God to every office in the church that is named in the Bible - apostle, prophet, pastor, teacher, evangelist. I think women have been called to these. I think some have answered, some have wanted to, and some have attempted. I haven't found a book that I think most closely describes my own take on it, but some get close, and provide excellent background study. I really love it when most of these freedom-giving books are written by men! A well-documented, thorough look at some of the most debated Bible verses regarding women's place in ministry and leadership in the church. It answered many of my own questions and literally set me free from bad theology which has pervaded the global church since it adopted a Greek- rather than Biblical-world view. A must read for both genders! This is a powerful book because it stomps on the stereotypes of Christianity. Cultural beliefs of sexism are not rooted in Christianity, they began much before this time. If you are a christian woman, you need to read this so that you understand your power and authority. If you are skeptical of Christianity then you need to read this too. Encouraging recognition of women in ministry. Cunningham, Loren, and David J. Hamilton. Why Not Women? 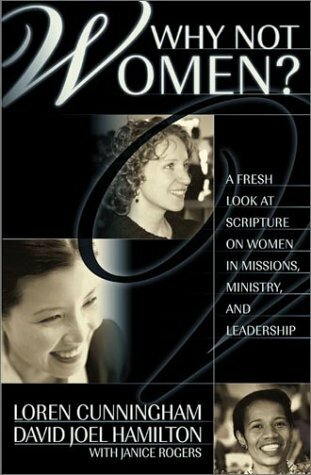 : A Fresh Look at Scripture on Women in Missions, Ministry, and Leadership. Seattle, WA: Youth With A Mission Publishing, 2000. This is a clear presentation of good exegesis of some controversial biblical passages. The case presented is is somewhat less than airtight, but such may be the nature of exegesis. I trust that my own thinking is greatly affected for the better having read Why Not Women? Excessively provocative topic in Christian circles. The factual handling of Scripture and original language writing was very informative. Knowing the info does not change the world I live in, but it is comforting to know that God esteems me highly even if it may seem people in the Church do not. Regardless of where you stand on faith, man or woman, you MUST read this book. Excellent and exhaustive historical resource! I don’t think I can possibly overstate my recommendation of this book. I’m sharing this review because I want to strongly encourage - nigh on beg - every Christian friend I have to read it. It is a deeply theological, well-researched, heavily footnoted, yet still incredibly readable look into some of the most challenging passages in the New Testament - passages that have confused me since I started reading reading the Bible for myself as a child. This book takes us back to the original contexts, I don’t think I can possibly overstate my recommendation of this book. I’m sharing this review because I want to strongly encourage - nigh on beg - every Christian friend I have to read it. It is a deeply theological, well-researched, heavily footnoted, yet still incredibly readable look into some of the most challenging passages in the New Testament - passages that have confused me since I started reading reading the Bible for myself as a child. This book takes us back to the original contexts, cultures and languages from which these passages came (including two incredible chapters on the Greek and Roman culture - I learned so much) and pulls them apart to get to the root - the heart of what the author was saying, and indeed what Jesus was saying to His Beloved Church - a church that has been known to then take the amazing, redeeming, freeing messages conveyed throughout the Bible and twisted them to restrict half of its members from using all of their gifts. Just, please read this book. Even if you disagree with every word, read each one anyway and be challenged by what these amazing authors have to say. This is an issue worth digging into deeply. This is worth talking about. An interesting book that looks at the most used anti-women in ministry Scripture and uses the lenses of history to interpret them. My opinion on the matter isn't important but it's a good book about the unity required by all believers in yielding to God's plan for their life and not our own. If you know someone who is adamant about women being lesser citizens in society and in church, I recommend this. NB. It is dated - it was written in 2000, before 9/11 and I believe that dates it a bit since w An interesting book that looks at the most used anti-women in ministry Scripture and uses the lenses of history to interpret them. My opinion on the matter isn't important but it's a good book about the unity required by all believers in yielding to God's plan for their life and not our own. Most helpful and logical book on the topic of women in leadership. Every Christian should read it. great book and great perspective! I loved the insight and learned a lot from this book! Very thought provoking! Will definitely re read again and do more deeper research. Clearly written, interesting and quick reading. This book goes into the Bible in the original text, as well as in our English translations, and contextually shows us how much God values women. God's word clearly states that male and female are equal, the two together are the image of God, men and women were created and directed by God to lead, serve, teach and in that support each other while glorifying our Creator. Both male and female are corrected and encouraged by God, and both are commissio Clearly written, interesting and quick reading. This book goes into the Bible in the original text, as well as in our English translations, and contextually shows us how much God values women. God's word clearly states that male and female are equal, the two together are the image of God, men and women were created and directed by God to lead, serve, teach and in that support each other while glorifying our Creator. Both male and female are corrected and encouraged by God, and both are commissioned to spread the word about Jesus Christ to all the world (without gender boundaries). If human kind followed God's word there would never have been a need for the women's liberation movement because women would not have been oppressed. But since sin entered the world, just as God said would happen, men have wanted to dominate women instead of embrace them as the gift from God they are. In the Garden of Eden when Adam was alone was the first time during all of creation God said it was not good, but once Eve was created from the same material as Adam, it was the first and only time God said His creation was very good. Male and Female together, equal - God's image and very good. The authors have said a lot of things that need to be said regarding the place of women in ministry. I have a great deal of respect for Loren Cunningham and Youth With a Mission and found myself in agreement with much of what he and his co-author said about women in ministry. Yet, there were places where they lost some believability with me. Without going back to re-read, I cannot point out the specifics, but there were a couple of cases where they took a Scripture and seeming just decided to mak The authors have said a lot of things that need to be said regarding the place of women in ministry. I have a great deal of respect for Loren Cunningham and Youth With a Mission and found myself in agreement with much of what he and his co-author said about women in ministry. Yet, there were places where they lost some believability with me. Without going back to re-read, I cannot point out the specifics, but there were a couple of cases where they took a Scripture and seeming just decided to make it say something besides what it says, to strengthen their case. I was surprised that a man in life long ministry and study of the Word would do that.